46th Legislative District legislators will hold a telephone town hall on Thursday, March 28, 2019 at 6:30pm. 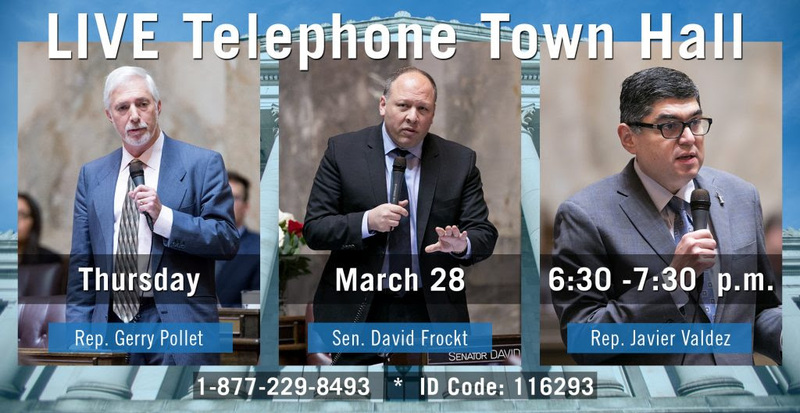 They will be calling households in the 46th Legislative District, but if you don’t have a landline or don’t receive the call, you can still participate by dialing 877-229-8493 and using ID Code 116293. You can also click on this link to sign up ahead of time to ensure you are on the call list. Or you can livestream the event online at 46th LD Telephone Town Hall. The 46th Legislative District includes part of north King County and the northeast section of the city of Seattle including Lake Forest Park, Kenmore and Lake City. The 46th LD is represented in the House by Rep. Gerry Pollet and Rep. Javier Valdez, and in the Senate by Sen. David Frockt.